Harold Lloyd on the 6-line. The first talkie by the silent film star was shown on a moving 6-line streetcar in 1929. 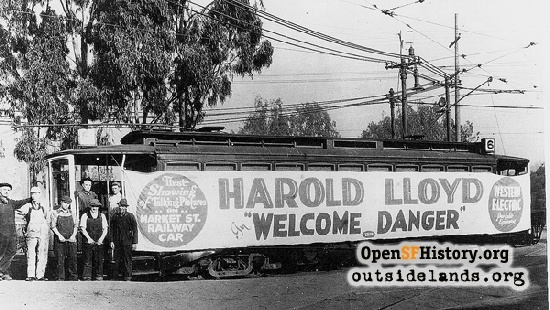 In 1929, two years after talking pictures had hit the movie screens of America, the voice of silent film star Harold Lloyd voice was to heard for the first time by millions of fans in his new film Welcome Danger. Lloyd played a bumbling botanist, the son of a former police chief, who finds himself called to San Francisco to "quell the flourishing crime among Oriental and American gangsters." In addition to opening at San Francisco's Granada Theatre on November 8, 1929, Paramount Pictures decided to run an experiment/publicity stunt. This experiment was conducted by Publix Theatres and Market Street Railway. A 100 series car equipped with the latest type of quieting devices was turned into a theatre by removing all the seats in the smoker section and creating a projection room. The inside of the car was covered with acoustical cloth to darken it and keep out traffic noises. The seating arrangement inside the car was not changed. Ten rows of leather seats served the audience. The schedule was so figured that the car would leave Second and Market at the beginning of the picture and make a complete circuit of the city without stopping, arriving at the point of departure just as the picture ended. Those who attended this theatre on wheels were surprised at the comfort the car afforded and the exceptionally clear reception of the new Western Electric portable talking motion picture equipment. Many odd incidents added to the entertainment of the audience. During the railroad scene in the picture, the car was passing Third and Townsend depot and the sound of real locomotives traveled through the ventilators and mingled with those from the talkie. The only conception many of the audience had of moving was when the lighted screen in the darkened car raised or lowered before them, showing that the vehicle was either climbing or going down a hill. Officials of both companies were greatly pleased with the results obtained from their respective equipment. In 2008, San Francisco's Municipal Railway is currently evaluating better ways to serve the public. Considering the frequency of "MUNI meltdowns," with trains stalled in the Twin Peaks Tunnel during commute hours, having a Harold Lloyd movie ready to roll might be a good idea. Thanks to Jack Tillmany, Walt Vielbaum, and the late Walter Rice for help with this article. Page launched 4 November 2008.